Positivity has been surging through Cleveland this summer. How else can you explain fans expressing concern about the fact the Cleveland Cavaliers‘ home opener – and championship ring presentation – is on the same night as Game 1 of the World Series? Worrying about picking between celebrating one championship or seeing the beginning of another is the kind of optimism you just don’t see in this city. Yet, here we are, with fans still soaking in the Cavs’ title while assuming the Cleveland Indians can net one of their own. Based on the Tribe’s recent performance, I feel it necessary to dust off an old adage to present to fans concerned about their October sports schedule. When it comes to the Indians’ trip to the postseason, let’s not count the chickens before they hatch. Despite hanging on to a 4.5 game lead, Cleveland has fallen on rough times, and its playoff berth isn’t as guaranteed as many imply. To be clear, I’m not trying to play doomsayer here. The Indians have been in first place for a few months now, and even survived a similar slump earlier this month. However, the past few games have been quite alarming, and the Tribe certainly appears to be hitting rough waters. After a thrilling weekend full of late-inning heroics, Cleveland has completely flat-lined. A cakewalk series against the Oakland Athletics seemed to be a perfect precursor to a huge four-game set visiting the AL-best Texas Rangers. Instead, the Tribe lost two of three to the A’s and followed it up with a 9-0 drubbing at the hands of Texas last night. Overall, Cleveland has been outscored 23-3 in the past four games. This stat alone highlights the big issues plaguing the team right now. For one, the Indians’ starting rotation is not the same vaunted unit we saw earlier in the year. 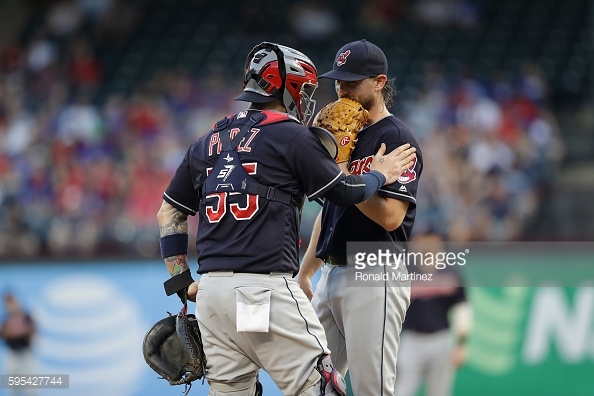 While Corey Kluber and Carlos Carrasco have each settled into grooves, Danny Salazar and Josh Tomlin have become train-wrecks. Salazar appears to be in a mental fog, only getting past the fourth inning once in his past five starts. Tomlin is one of baseball’s most charitable pitchers this month, donating home runs to the opposition left and right while sporting a 10.30 ERA across his last 30 innings. It should be noted the team’s starting pitching hit a similar slump to open August, as well. At the same time, the Indians ended up righting the ship because the offense was still contributing. That hasn’t been the case this week. As mentioned, Cleveland has only mustered a combined three runs in the last four games. Hits have come few and far between, while having runners in scoring position is a rare scenario. Facing a Rangers team which can put runs on the board with ease, the Tribe simply can’t afford to go this cold at the plate. Complicating things is the fact the Detroit Tigers are revving up yet again, trimming three games off their first place deficit in the past few days. The Indians, meanwhile, have struggled with pitching, hitting and even fielding. They still have three more games against Texas before heading home to take on a miserable Minnesota Twins team which has inexplicably owned them all year long. That said, is it time to hit the panic button, or is this just a poorly-timed funk the team can steer its way out of? Honestly, it’s tough to say. A 4.5 game lead is still relatively solid. At the same time, while Cleveland is trying to survive the Rangers series, the Tigers head in to a weekend set against the last place Los Angeles Angels. Should the Indians lose the series or, worst-case scenario, get swept, their grip on first place could be razor-thin come Monday. Cleveland is built to survive based on its starting pitching, which is currently sporting a collective 6.13 ERA this month. The only thing making the struggles worse now is the fact the messy pitching is being coupled with minimal hitting. Returning to the original question, how worried should fans be about this? Personally, I’m not in “it’s over” mode, but that’s not to say I’m not nervous. The final month of the season is littered with divisional opponents, so the Indians can’t afford for this slump to last much longer. A 7.5 game lead with a month and a half left before the playoffs is a great spot to be in. Should Cleveland choke it all away, it would be a devastating blow. We’re not at that level of panic just yet. If the pitching doesn’t get is collective act together while the bats remain quiet, we’ll be there quicker than you know it. With that in mind, what do you say we put a hold on scheduling around potential World Series games until the Indians actually get into the postseason?